First of all, this was a great online advertising question which most bloggers or people willing to sell their traffic should be asking. Online advertising is always are tricky business both for online advertisers and Ad publishers. When I received this question on Quora, I decided to answer in more details to help others understand how they can determine advertising cost on their Ad sites so it will be fair for both parties. 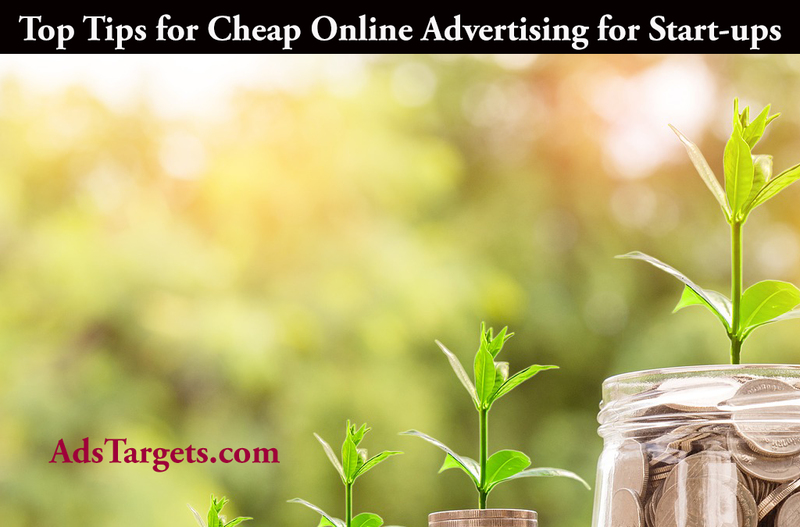 Here are the few but very important things you need to consider when asking for advertising cost on your blog or website. If you have good traffic and want to monetize your traffic for a fairly high price, Use these tips and indicators to determine your advertising cost. This means your traffic source by geographical location, If you have a good amount of traffic from specific locations lets say the USA, The UK, Canada, Germany or other regions that are considered as high-value traffic zones. You should be able to charge a bit higher than someone that has traffic that is coming from other GEOs such as Vietnam or Nigeria. This is because traffic from these sources has higher conversion rates period. The secret you should know is that All the big advertising giants like Google, Facebook, Bing, and many other Ad Networks charge higher ad prices for clicks and impressions coming from those GEOs. On the other hand, they also pay publishers higher for clicks and impressions for their traffic coming from those GEOs. So, GEOs are very important when it comes to determining the cost of advertising on your Ad website or Blog. If your website or Blog has traffic that is coming from a targeted source from people with interest in a particular niche you may consider charging a fairly higher price for your ads. This is because this type of traffic will have a higher rate of conversion and more advertisers would want to advertise on your website or blog especially if the niche is selling very well. The perfect example of this maybe Sports traffic. If you have massive sport traffic on your website, you should understand most advertisers within this niche will be willing to pay a higher price for your traffic in most cases. This is the Click through rate, You will have to try advertising your own product to ascertain the Ctr of those ads and then make your decision based on that too. If your ads display on your website or Blog has a very high click-through rate, you should consider it as a good indicator and work with it. The source of your traffic may also play a key role in determining the cost of advertising on your website and by traffic source, I mean where the majority of your traffic is coming from e.g Organic traffic from search engines, Social media traffic, Traffic from email marketing etc. Of all those traffic sources, Organic traffic may be the most unique and profitable traffic source anyone can ever get online. If you spent a lot of time doing quality SEO and at the end, you have great results, you can consider looking at the keywords you rank very on and charge approximately what Google is charging for those keywords. That way, you will fully optimize your profit many year or months of search engine optimization you have been doing. Now, this is where the Ad price varies. 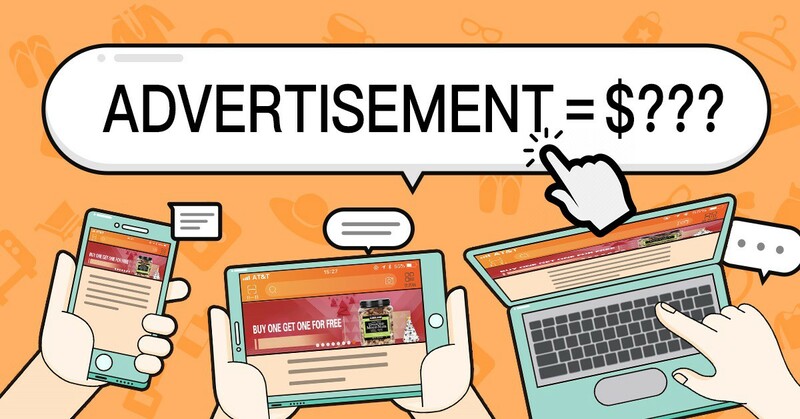 Depending on your advertising technology, If you have potentials for interstitial Ads, Banner Ads, Text Ads or even In-App ads, You should set the price based on these features. You may consider charging more Interstitials ads these Ad types have the ability to capture audience attention more than another Ad type. You may also consider asking for a higher amount on larger banners and Text Ads depending on their appearance on your website. Here you should basically consider asking for a price based on the space they cover and the position those Ads are placed on your website. Ads that appear on the top of your website should be charged differently because your visitors are more likely to see those ads before other content on your website. 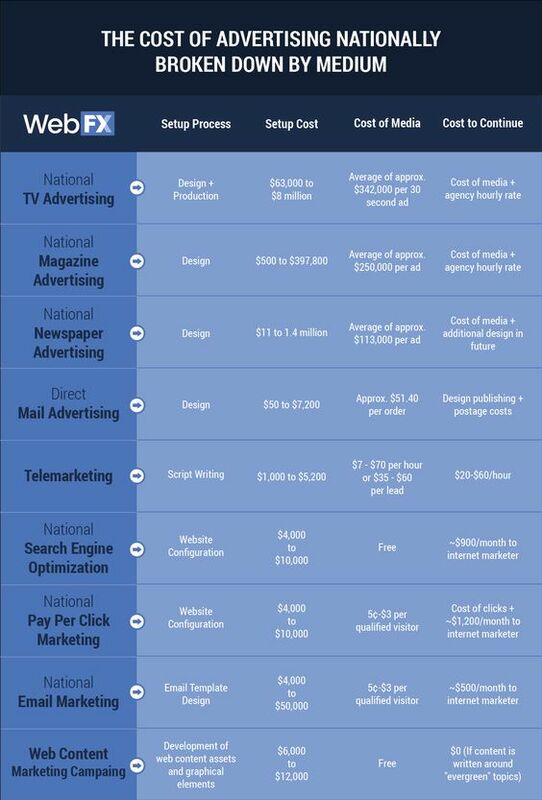 The Cost of advertising broken down in the infographic. Haven’t had those points, I would want us to take a look at the cost of advertising as distributed nationwide. This price is broken down to give you an approximate figure spent on advertising. 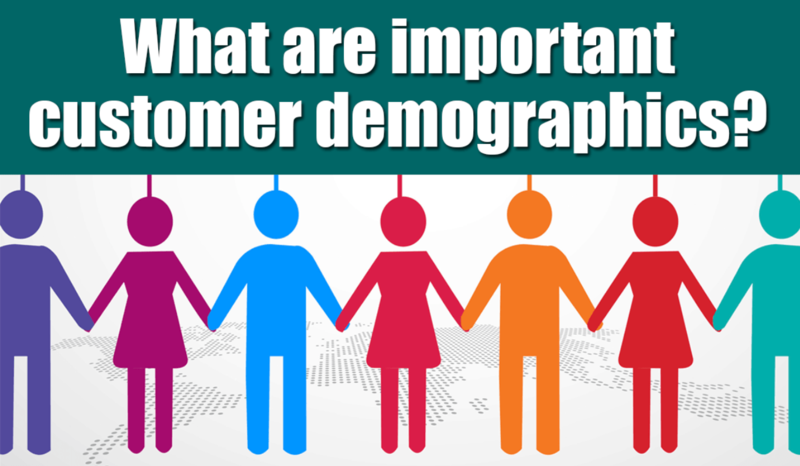 It will also help you figure out how much you can possibly charge for advertising based on your niche audience size.